I have been a member of the Maker’s Mark ambassador program for over a decade, which means I was fond of bourbon at far too young an age, and I drink a bit of it. Bourbon drinkers are funny, in fact you could call us particular. That’s why I scratched my head two weeks back when I received an e-mail through the ambassador program from Rob Samuels, who has taken over as the Ambassador-in-Chief from his dad, Bill Samuels, Jr., which discussed how the popularity for Maker’s had outstripped supply, and in order to continue meeting demand the Loretto-based distillery was going to decrease its alcohol volume from 45 percent to 42 percent per bottle, taking the proof down from 90 to 84. It takes the better part of six years to get Marker’s Mark from a barrel to a bottle, so a shortfall today is the result of guessing conservatively in 2007 how many thirsty people there would be in 2013. Obviously seeing this kind of growth in demand is a good problem to have, but tinkering with such a successful recipe is dangerous business. The popular brand, ever noticeable by its squared-off bottle and red wax seal, has been struggling to keep up with demand for years. The idea here was to add “a touch more water” when the whiskey came out of the barrel for bottling, which would dilute the original alcohol content, and would allow Maker’s to increase its distribution amount by 6 percent. Over the last two years Maker’s has invested $54.3 million into its Loretto facility, expanding the distillery to increase production capacity by 45 percent, and adding warehouse space for an additional 100,000 barrels of aging bourbon. It’s not like they are going out of business. They are making wise investments, just hold tight and it will come, but don’t mess with a good thing. I’ve been on the Maker’s bandwagon since high school. Even though Jim Beam now owns it, the label still handcrafts its entire product and produces small batches, which has maintained the brand’s overall quality. That kind of attention to detail is evident in each bottle and comes through with every sip. As the profile of bourbon has increased over the past 20 years, there have been several new brands to come along, like Woodford Reserve and Bulleit, along with a bevy of established labels producing offshoot super premium and small batch labels, like Blanton’s from Buffalo Trace or Booker’s from Jim Beam – but Maker’s Mark already was doing all these things with its standard bottle. 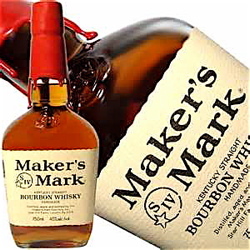 When I first started going to college in Iowa in 1987, I couldn’t get Maker’s Mark anywhere out there. I went from bringing one bottle back at Christmas or Thanksgiving, to becoming a mini-bootlegger, filling my car with cases of this liquid gold to provide to needy converts in the Midwest. My guess is the ambassador program grew out of Bill Samuels Jr. going around the country and hosting cocktail parties for wayward Kentuckians who knew the medicinal value of a Maker’s Mark cocktail. When I moved to Washington, DC, I would bring a slew of people to those happy hours at the Old Ebbitt Grill. Samuels would be there ebullient as ever in formal wear and top hat, ready to spread the gospel of bourbon. The ambassador program was a brilliant way to recognize Maker’s devoted followers and increase its brand’s profile. It was the first of its kind, and a fun way to promote one of Kentucky’s natural resources. Hell my buddies and I ended up doing a focus group for Maker’s one night on Capitol Hill. There were four or five of us and a bottle of whiskey. I would love to see that video. What I don’t want to see is any change to the recipe or harm coming to the label for a short-term fix. As I mentioned at the start, I scratched my head when I read that first e-mail about diluting the alcohol content. It didn’t seem like that was going to go over well. A week later, on Sunday February 17, the second e-mail arrived explaining after an overwhelming response Maker’s Mark would not be reducing its alcohol-by-volume. 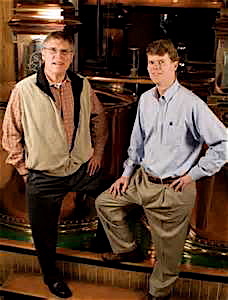 On the left is Chairman Emeritus Bill Samuels Jr., and right is his son, Chief Operating Officer Rob Samuels. They made a mistake and had the good sense to admit such and fixed it quickly – now Maker’s can get back to making some of the finest whiskey on Earth. I’m sure Beam, Inc. is concerned that another bottle might replace Maker’s on shelves if suddenly the distinctive redhead isn’t available. Thing is, there is no replacing Maker’s Mark. That’s like trying to replace Jack Daniel’s. Can’t be done. Maker’s has a distinct flavor and look. When I’m in the mood for it nothing else will satisfy. But one final cautionary message to Jim Beam, please don’t go jacking up the price of Maker’s Mark to compensate for its lower availability. Attempting to price-out usual customers from their brand as a way to limit demand is a horrible idea. This entry was posted in Food and tagged Jim Beam, Loretto, Maker's Mark. Bookmark the permalink.